Double leaf smoke vents equipped with a UL listed 165º F fusible link for automatic operation. Certifications: UL Listed # ZBDZ.R16688. 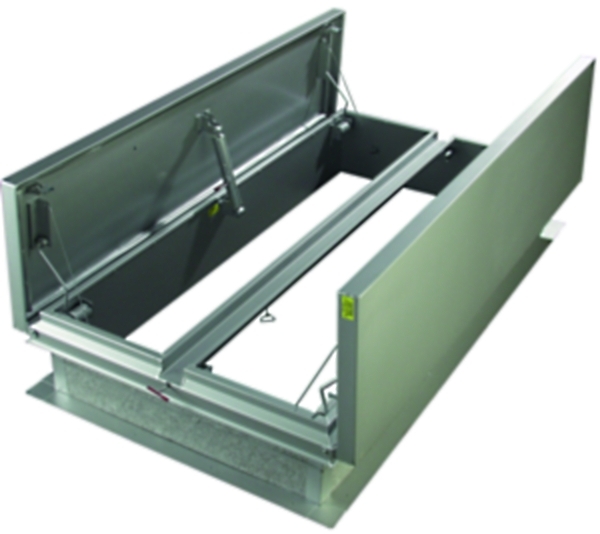 Tested to meet ANSI/UL793 standard for automatically-operated roof vents". The smoke vents are equipped with a UL listed 165º F fusible link for automatic operation. Construction: Covers are 11 gauge aluminum insulated with fiberglass, 14 gauge galvanized steel curb and curb frame fully welded and ground smooth, gasketed and insulated for weather tightness. See below for polyisocyanurate insulation option. Operation: Torsion spring drives open the covers automatically. Shock absorbers control the speed of the leaves as they open. The fusible link can be quickly and easily replaced. Hardware: Heavy gauge aluminum 3/16" pivot hinges. Pull handles are provided for exterior or interior manual operation. Finish: 2 coats of factory-applied primer.